I am so happy with all the summer fruit! I scarf up blueberries, cherries, peaches, apricots, and nectarines with hedonistic abandon. In my zealousness, I bought way too many nectarines at Monterey Market; as they all became ripe at once, I tried to eat as many as I could. I was daunted as my belly could take no more, yet I didn't want these lovelies to go to waste, so I quickly made up a batch of flaky pastry dough and this year's first summer galette was born. Otis, the pickiest member of our family, was hesitant to even try the galette. He was convinced he wouldn't like it. At his request, I gave him the tiniest of slivers. He ended up coming back for seconds, thirds, and fourths. This nectarine galette has very little added sugar and is really good served with a scoop of vanilla ice cream. At least a couple of hours before you want to eat your galette, prepare dough according to this recipe. Remove your chilled dough from the fridge. Let it warm up just enough so that you can roll it out. (I still like to roll my dough between two pieces of parchment to avoid too much sticking.) Dust disk of dough with a sprinkling of flour, sandwich between pieces of parchment, and roll out dough until it is about 1/8 thick. 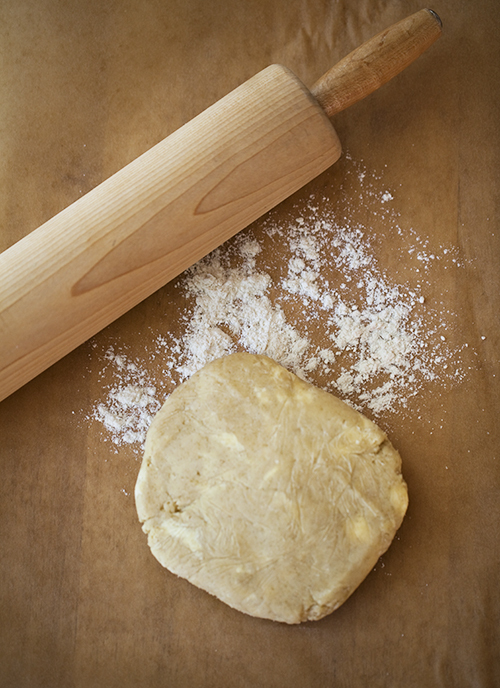 Put rolled-out dough back in the fridge to chill while you prepare the galette filling. 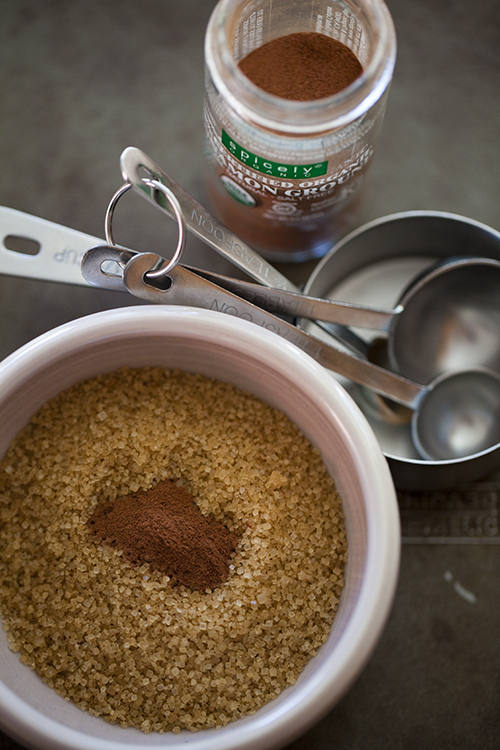 Mix cinnamon with the Turbinado sugar. Remove chilled rolled-out dough from fridge. 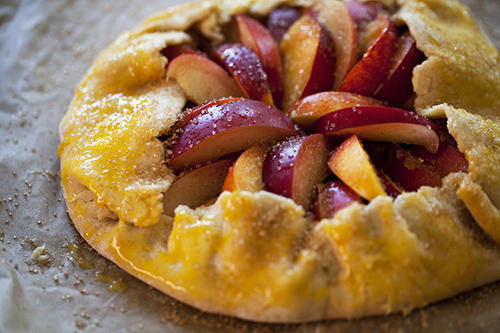 Sprinkle 1-2 tablespoons of the cinnamon sugar onto the dough before you arrange the nectarines. Arrange the nectarines in slightly overlapping pattern. Sprinkle 1-2 more tablespoons cinnamon sugar over the tops of the slices. Fold up the dough around the fruit. With a galette, the edges can be rough and rustic. Brush the top of the crust with egg yoke. Sprinkle a bit more cinnamon sugar. Cook the galette on a layer of parchment, supported by a baking sheet. Bake for approximately 40 minutes on the lower part of the oven until the crust is golden brown. Let cool for at least 10 minutes before serving so that the fruit juices thicken a bit. Add a scoop of vanilla ice cream or some sweetened whipped cream and enjoy! 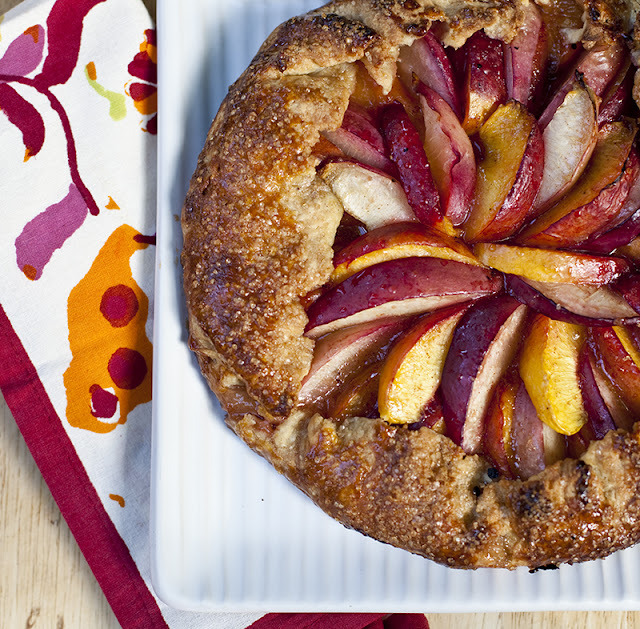 Such a simple galette is really easy to make - give it a try. Oh, how gorgeous! I really need to make a galette, especially with all this fruit. I had to make sorbet with a load of white nectarines the other day before they went off - really gorgeous way to use them up. Beautiful. Always wondered how they were made and didn't think about how rustic they can be. I'll try it with gluten free flour and maybe maple syrup. I've been trying out xylitol too. Love the step by step photos. Keep 'em coming E! looks delicious, i'm making blueberry-raspberry galette today, let's see how it turns out! Adriana, a blueberry- raspberry galette sounds delish! 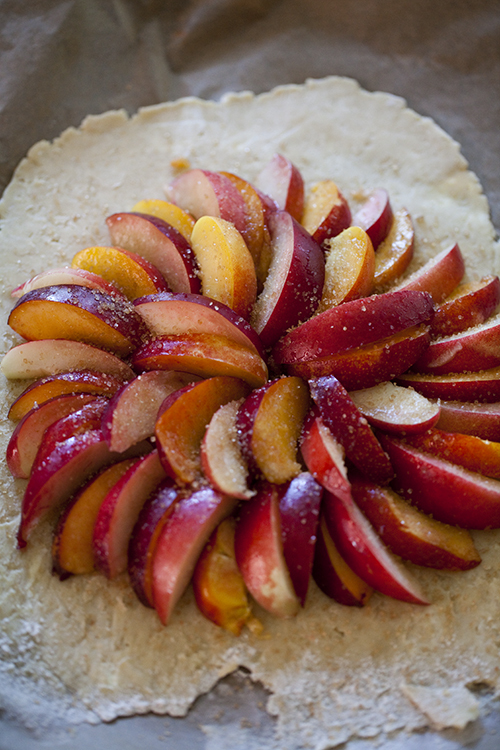 This galette looks absolutely beautiful. There's nothing better than a simple, beautiful dessert. Marites, your comment made me so happy. I hope you liked the galette. Aren't nectarines so delectable!! 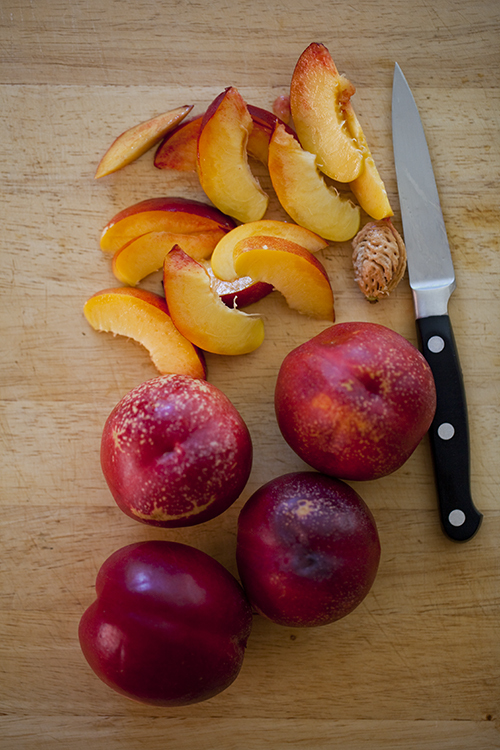 Adriana, I am dying to make your grilled nectarines... Yum!! Here's to happy and delicious holidays!